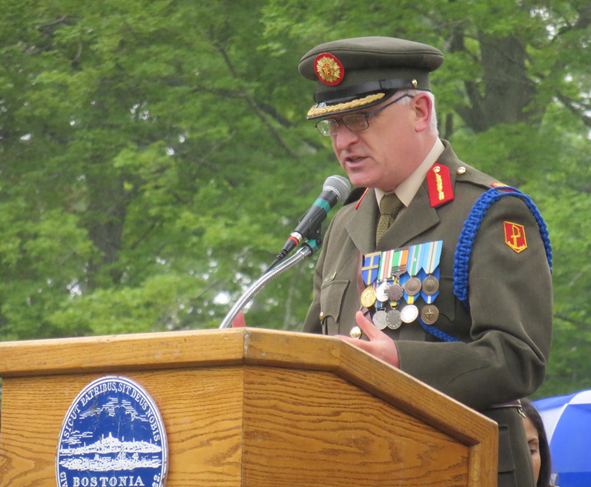 “Some short weeks ago I stood at a memorial site in South Lebanon and paid tribute to my fallen Irish colleagues who had made the ultimate sacrifice in the cause of International piece. As the honor guard paid tribute many of us shed tears for our friends and colleagues. “Today, as I marched to Cedar Grove Cemetery. I had that same feeling of loss I had those short few weeks ago in South Lebanon. “I commend you for the honor you have been paying to your fallen heroes since your first tribute here in 1868. I commend the people of Dorchester for the honor you bestow on the men and women who served their nation and made the ultimate sacrifice. “Marching here, I pondered how your nation every spring celebrates this holiday called Memorial Day, which, I am told by my brother Damien, traditionally marks the beginning of summer. I know it is a day for celebration, sharing family time, and offering parades for the entertainment of adults and children. “But as a soldier I know not all Americans can find it their hearts to celebrate - some children may not have a parent’s hand to hold as the parade passes by. Fathers, mothers, siblings, partners are heartbroken for loved ones who died for their country and the values they held dear. “I truly empathize with the families of the fallen heroes and I want to thank you for your heroes who sacrificed so as we can enjoy freedom and democracy. You have a right to be proud of them. We are. “Soldiers of the USA and its allies wear the uniform of service so others do not have to. We are the insurance policy for freedom, democracy, sovereignty, and to ensure the rest of our societies enjoy the land in which we live. Every single day there is a soldier somewhere far away from home protecting our sacred values. “Soldiers of the USA and its allies share a set of values that makes each soldier stand out as a special human being - values like respect, integrity, loyalty, moral courage, physical courage, and selflessness. Soldiers do not just agree with these values, they enact them every day, and it is these values which make them special and lead them when required to make the ultimate sacrifice for their country. “Please take a moment of reflection as you view their graves remembering the fallen for their service to us all. We owe them our freedom and democracy. When we have achievements that are based on theirs.